Plot: British troops, surrounded by Nazis on all sides, await their fate while the British Navy and Air Force try to support them by any means necessary. One of the finest films in recent memory, Dunkirk takes you by the throat and has you struggling for breath. Stunning on every level. Rarely is a film as meticulously or as perfectly directed as Christopher Nolan’s Dunkirk. That might sound hyperbolic but the reality is Dunkirk should see The Dark Knight helmsman win all the awards going. From it’s opening scene to it’s closing moments there is an undercurrent of tension that Nolan creates that never lets up. It’s sometimes subtle, bordering on the subliminal, such as the ticking clock that acts as the perfect antagonist in a film that otherwise never feels the need to view the looming Nazis coming to obliterate the allied forces. Sometimes it’s a typically Nolan visual that has you holding your breath, often without realising it. 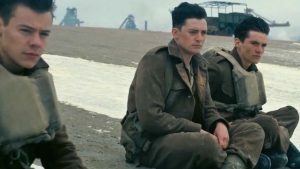 What Nolan has done with Dunkirk is the sort of masterclass in tension building that would have Hitchcock resoundingly applauding. This is less a ‘war film’ per say. Very few shots are fired – although Tom Hardy‘s Spitfire pilot gets some jaw dropping action sequences – but more a survival film in the vein of The Martian or Cast Away. The British troops on the beaches of Dunkirk assume their time is up, even when their transports arrive you suspect everything could still go awry. Rather, this is a film about individuals essentially waiting to die. Nolan shooting the beaches as a bleak, ice-cold purgatory just waiting to swallow them up in chaos. Amid the encroaching death though there is a typically stoic British stiff-upper-lip going on. 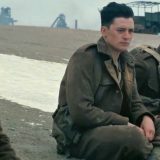 From Mark Rylance’s determined sailor, Kenneth Branagh’s calm under pressure naval captain through to Tom Hardy’s steely determined pilot it’s impossible not to be swept up in both their imminent peril but also their laser guided focus to not necessarily survive but help their brothers in arms make it home in one piece. Crucially what Nolan has done is tell the story across three related but separate timelines. In doing so Nolan, aided as always by the majesty of Hans Zimmer’s score, is able to manipulate your anxiety levels to nail chewing levels. All the while that ticking clock keeps going, like the crocodile after Captain Hook you cannot escape the fact it’s going to catch up with us at some point.